Camouflage is the new black. Whether you are military, a hunter, or just trendy, your little one will love this camo. Using shades of greens, browns, and blacks it is the perfect blend for today's camo. A wide band using coordinating colors runs down the middle of this design. 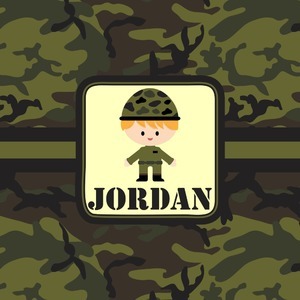 A square label, outlined with camo colors, showcases our little military man with added personalization for the special touch.